Welcome to Fir and Hazel Class! 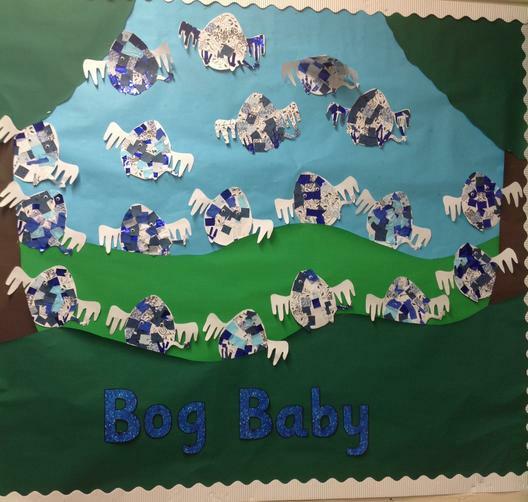 Year 2 started the term with our exciting topic based on Jeanne Willis's book 'The Bog Baby'. We were given the task of caring for Bog Baby by the girls in the story. We wrote instructions to help us and in Science we learnt about what animals need to survive. When Bog Baby went missing we created missing posters and wrote letters asking him to come back. We even made Papier Mache and clay Bog babies to entice him back. 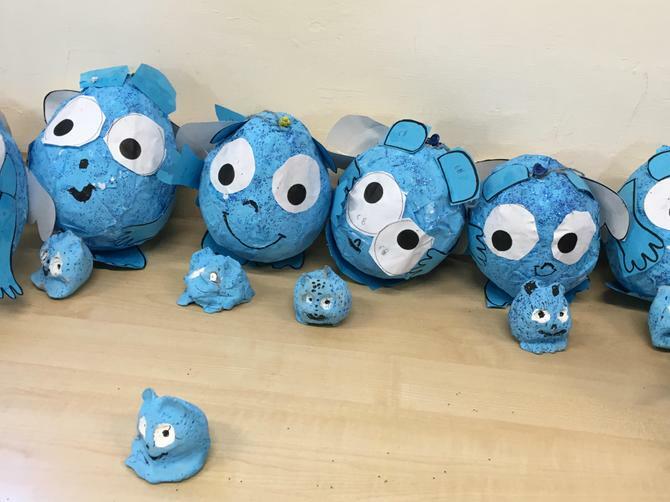 Monsters have been sighted around Holyoakes Field First School! 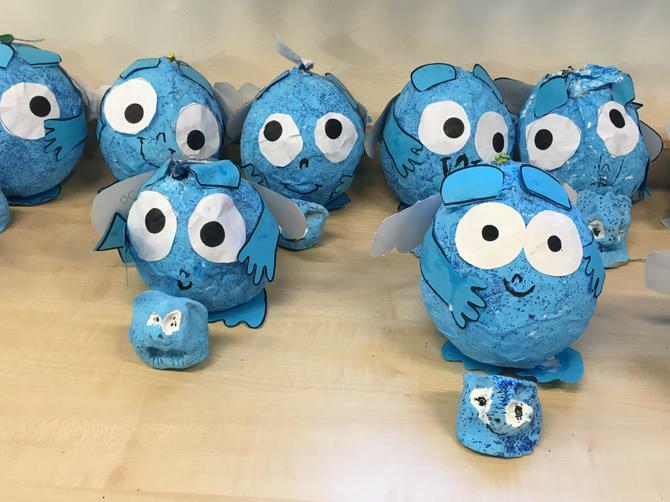 Year 2 have been creating monsters using the clues and writing descriptions. We have been reading 'Monster Machine' by Nicola Robinson. We wrote instructions to help the inventor work the machine and even created our own monster machine. 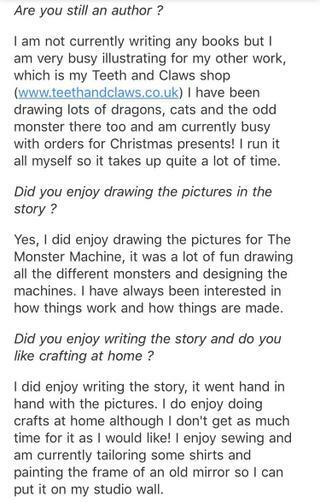 To find out more about the monsters children thought of some questions to ask the author and the monsters. 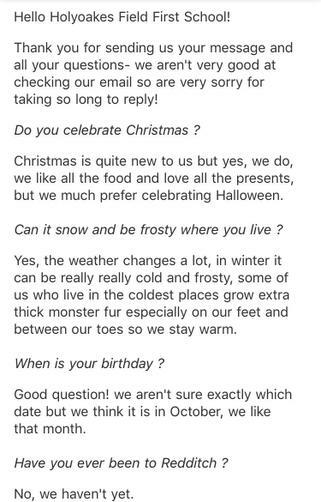 They emailed the questions and had a wonderful response back. 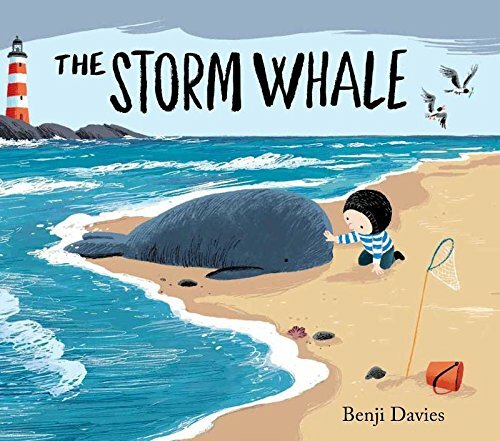 This term Year 2 have focused on"The Storm Whale" by Benji Davies as our class text. 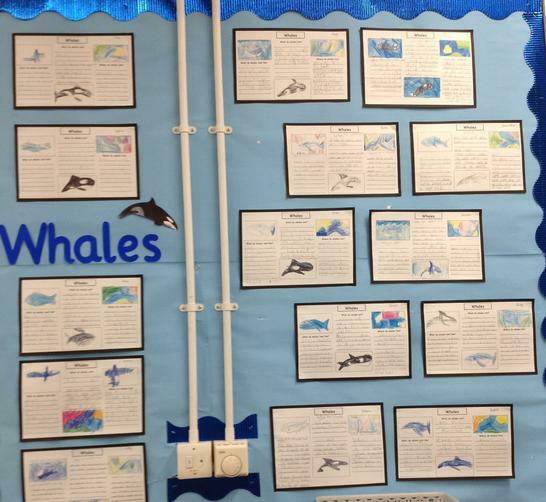 To start the topic off the children were asked to research and find out interesting facts all about whales. The children then turned these facts into some amazing fact files. We then read the text and began to explore the relationship between Dad and Noi. 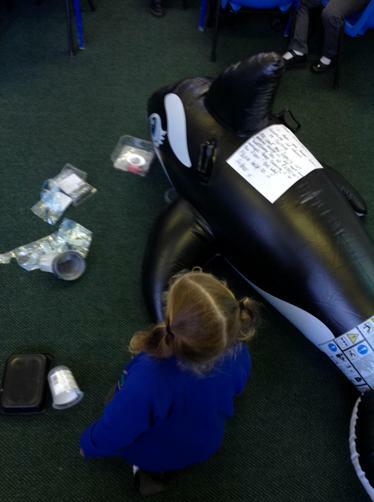 The children wrote a diary entry about Noi's adventures on the island, a character description, an alternative story opener from the whale's point of view and a storm poem describing the storm. 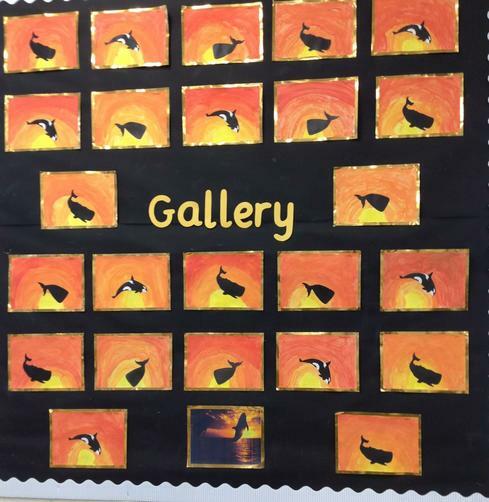 In Art the children explored the storm whale's habitat and recreated this using silhouettes of different whales. To finish the topic we made our own bread rolls in DT for Dad and Noi to enjoy together on their picnic and taught them to make healthier choices for their fillings. In Science we investigated different materials and took part in an experiment to decide which material would be best for Noi and Dad's rain coat. The children loved this book so much we read "The Storm Whale In Winter" and "Grandma Bird" to compare the books and give reasons for which one we liked the most. 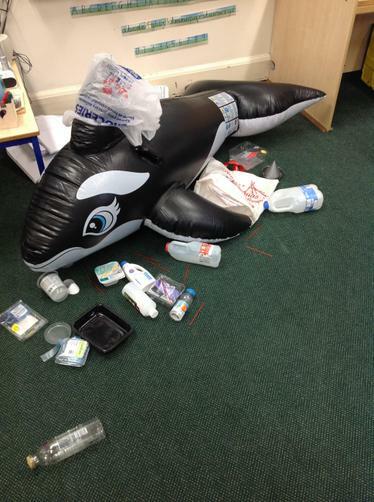 As part of our topic "The Storm Whale" the children found Arthur, who arrived in Year 2 with a very important message. 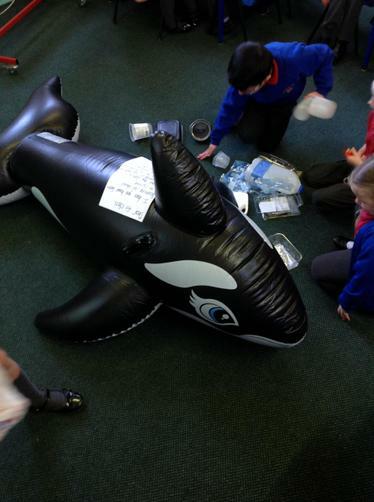 The children found that plastic was making its way to the ocean and hurting Arthur's pod. So the children decided to help, my making posters informing others how to STOP this from happening and how to be more Eco friendly.